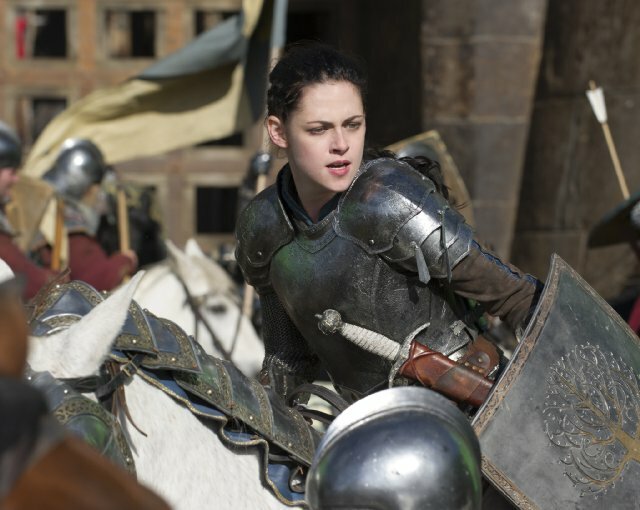 There’s a lot to like about “Snow White and the Huntsman,” and a lot to dislike. This grittier take on the familiar fairy tale is likely to divide audiences into those who demand intelligence (or at least not willful stupidity) from movies and those who just want to be taken for a fun ride. If you’re in the latter group, you’re in for a good time. Kristen Stewart once again plays the girl everyone either wants to kill or wants to save — but in this case, nobody is pretending she’s ordinary. Her Snow White is beautiful, surprisingly fit for someone who’s been locked in a small room for most of her life, and able to hold her own against hardened soldiers with only one or two lessons. I was impressed at Stewart’s range here, and would love to see how she performs for a truly skilled director. The Huntsman (Chris Hemsworth), sent to bring Snow White back after she escapes the Evil Queen’s dungeons, is a solid antihero — he’s drawn against his nature into helping the young princess win back her kingdom. Snow White’s other gallant, young William (Sam Claflin), is a Duke’s son and about two steps shy of Prince Charming. Unfortunately, he’s given tepid dialog to work with and apparently exists only to provide a third point for a potential love triangle in a sequel. To the film’s credit, it shies away from romance. Snow White is too focused on her goal to bother dallying with either of the improbably handsome men who are allied with her, and they both seem more interested in admiring her strong will than in flirting with her. It’s a pleasant change from the usual tropes. Any popcorn movie is only as good as its villain, and Charlize Theron chews scenery with the best of them as the Evil Queen. She handles the extensive makeup and CGI necessary for the queen’s shifting youth with grace, and sells the over-the-top character solidly. If, however, you can’t quite buy a villain declaiming while standing in a pit of fire and allowing her skin to be burned off as an intimidation tactic, you may not find her satisfying. The piece of casting where the film really lost me was the seven dwarves. They are played by the heads of famous British actors CGI’d onto little-person doubles. Not only does this look odd in a number of shots, it strikes me as being the modern version of blackface. If it’s not okay for white folks in the forties to have taped their eyelids and worn fake buck teeth to play Charlie Chan and Mr. Moto, how is it okay to put average-height actors in false noses and use CGI to make them small? Why not hire actual little people to play the parts? There are plenty of skilled short actors around. Where the film really succeeds is in its visuals. Snow White wears armor that actually looks like it might protect her, people actually get dirty and bloody when fighting in the mud, and the various supernatural creatures are stunningly created. The look of the film is impressive, and that’s the most crucial part of any creation in a visual medium. Where “Snow White and the Huntsman” really fails is in its script, which is full of gaping plot holes and at times laughably bad dialog. If you want your movies to make sense as well as being pretty, this is not the movie for you. If you just want to let your brain go on vacation and enjoy yourself at the movies, it may be right up your alley.